This day started badly. No two ways about that, because it started with a hill, tick paranoia, a wrong turning and then another, much worse hill. But it did get better as it went on. We started out from Mrs Dallyn’s with a really epic breakfast and a lot of time spent looking at tick bites for signs of Lyme’s Disease. But there were none. We seemed to have managed to throw the entire contents of our rucksacks about the bedroom on the previous evening and so had some serious repacking to do. Lisa was so concerned about parasites that she was wearing leggings tucked into socks and a thick long-sleeved top in the hot sun. Being loose-fitting, it was cooler than she expected, but not cool enough. It was a lovely morning and, after about half an hour spent saying goodbye to Mrs Dallyn and her very ancient dog, we set off down the hill to Hunter’s Inn where the peacocks were sitting on the roof and balconies and squawking in an eldritch fashion. 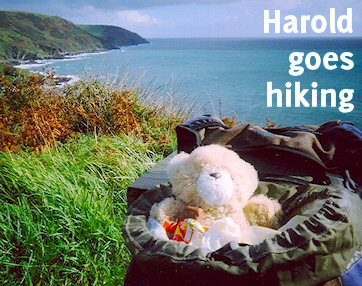 There was some evidence of pensioners in coach parties so we set off down the road and, after half an hour or so in the National Trust shop, bought a small bear who we named Countisbury and was a very suitable size for rucksack transport. The NT shop was also swarming with an elderly coach party and we had to leave our rucksacks propped up outside while they stared at us and we ate some ice creams. After leaving the shop we walked down the road for at least a mile before Andy realised we were going in the wrong direction. We were trying to find the diversion which would lead us up onto Trentishoe Down and back onto the coast path without actually having to risk our lives going round the side of that bloody hill again. The road itself had been pleasant enough, with the odd cottage, little streams, lots of wildlife and an old mill and farm buildings up for sale. We spent a while speculating what it would be like to live there. The turning round and going back was extremely demoralising and caused a row – “If you can’t read a bloody map don’t try”. “Well, we know you can’t read a bloody map even if you do try” and so on – before we arrived back at Hunter’s Inn and found the right road. We had to go through Trentishoe to get back to the coast path on the downs beyond. Andy said: “Do you want to walk up a long, gentle slope or a short sharp one?” It seemed logical to get it over with quickly but what followed was rather unpleasant as tempers were frayed. We were resolved to call a taxi at Trentishoe but the place is too small to have a public telephone which is a good thing because the rest of the day was very nice. An hour looking around the tiny church in the shade put everyone back in a good humour and it was up onto the moorland again and picking our way along a tiny road through sheep country for the rest of the morning. Ours may not have been the official route but it was a very good one. We had been walking slightly above the official path and we rejoined it just before Holdstone Down. The weather was warm and sunny and we were glad to have views of the sea once more. But suddenly the land dropped away under our feet and we picked our way down something that we still looked at with wonder even after walking between Hartland and Bude. The Great Hangman is one of the highest points on the whole South West Way and it is a bit of an anti-climax to get it over and done with so early. The valley which comes directly before it drops steeply to a tiny stream and then you are scrambling up something which is as nearly vertical as possible while still being climbable. The people you meet at the bottom, usually dog-walkers, have a slightly stunned air when they realise they have come all the way down only to go all the way up again. When you pass the Great Hangman’s lower slopes the climb becomes more gradual and quite pleasant until you reach the peak. During our climb the weather began to cloud over and by the time we got to the top it was quite misty. Then came the drop to the Little Hangman followed by the descent into Combe Martin which is longer than it looks. It starts off on moorland, goes into little hedged lanes and ends on concrete footpaths. We came down into the village past people’s back gardens and finally passed the sign which showed we were leaving Exmoor. It said we had walked 35 miles but it felt more like 350. We walked through the village, past the harbour and up another damned steep hill to reach a campsite close to the nearby settlement of Berrynabor. We flung down our rucksacks, pitched our tent in the nearest available spot and rushed to the shop to buy luxuries like bread, butter, fizzy lemonade and newspapers. And that, until the next year, was the end of our walk. We spent three more days in Combe Martin before going back to London, collecting a bigger tent and spending a week we should have spent walking north Devon and a sizeable part of the north Cornish coast on a camping holiday. We did everything there is to do in Combe Martin without a car including walking right up the valley, visiting the church and the lime kiln and eating our way through all the chip shops. We spent plenty of time poking around the harbour and were lucky enough to be present for the annual Hunting of the Earl of Rone festival. But mainly we lay in our tent, reading books and newspapers, and being very glad not to be walking. We had learned some lessons that would stand us in very good stead in years to come.